The building community seems to go back and forth on this one. Most people agree that it can look amazing if done well, but some would contend that it’s a bit overdone. From my perspective, the only thing that might be a bit overdone in this realm is black carbon fiber wrapping. But there is a veritable rainbow of colors available to builders. My own build, which you can see in the photo above, uses cut-outs from a roll of electric blue carbon fiber wrap to add some splashes of color to its otherwise black-and-white look. One thing I really like about carbon fiber wrap is that it can hide potentially unsightly or incongruous elements such as company logos and printed labels without voiding your warranty, since it can always be harmlessly removed at a later date. In theory, ‘no LEDs’ folks could even see the use of this stuff as a means of covering an LED on an otherwise unassuming part; but I haven’t tested that, so the light may overcome your efforts. One last thing: I know this is an adhesive product that can be used to make your components look good, but please don’t apply this stuff to any sensitive components or areas of PCB on any of your parts. Limit it to plastic surfaces wherever possible. You might also want to completely avoid heat sinks unless you know what you’re doing. Some carbon fiber wrap products are capable of shorting components. You’re unlikely to see too many (safe) uses for these mod tools inside of your build. But on the outside of your case, spray paint or Plasti Dip can be used to achieve custom color schemes or (when used in conjunction with one or more stencils) even custom designs. I didn’t use anything quite as permanent as paint anywhere in or on my tower itself, but it did see some use with my peripherals. I picked up a can of black spray paint and used it to paint some of the detachable plastic parts of my Behringer USB audio interface and my nice, cheap TH-02 headphones. Preparing a surface for a coat of paint or Plasti Dip might involve doing some sanding and will definitely involve working with the chemicals of the spray itself, so be sure to do any relevant work in a well-ventilated or exterior area. First, custom cables are costly. Like, think possibly resembling the price of your PSU. And that’s whether you’re buying custom cables from your PSU’s manufacturer (like these red Corsair cables, or the Thermaltake cable above), custom cables hand-sleeved according to your specifications, or even re-sleeving your own cables. Second, custom cables can be dangerous if you don’t know what you’re doing. The cables that come with modular and semi-modular power supplies are not — I repeat, are not — interchangeable between different power supplies. Attempting to mix and match cables on a whim is a recipe for fried parts or worse. So the only two ways to do this mod right are to sleeve the cables that came with your power supply or to buy custom cables that were made specifically for the exact power supply that you own. Third, doing your own custom cable sleeving (perhaps with the cables that came with your own modular power supply) is an enormously time-consuming project. Sure, the results can be mind-blowingly beautiful. But be prepared to set aside many hours for a tedious process. If you’re not deterred, here’s a good how-to video to get you going. So, this is the only one here that is arguably not a modification, per se (unless you’re talking about something like custom keycaps on your mechanical keyboard). But it’s also one of the most straightforward and reasonable ways to improve the look of your build while you’re planning it out, in addition to being one of the key areas where you can take a ‘no LEDs’ stance most seriously. In general, you shouldn’t let the color of your parts dictate your build. But if you really have no significant preference among several variants for a given part (say, a couple different CPU coolers or a few different manufacturers’ graphics cards that each contain the same GPU), then it doesn’t hurt to let looks be one of your deciding factors. This is especially relevant when you’re making a decision about a part that is already heavily dependent on your aesthetic tastes, like the case. There might not be a massive margin of functional difference between two mid-tower ATX cases like the Corsair SPEC-ALPHA and the NZXT S340, but different builders are likely to have a preference one way or the other. Admittedly, this is my least favorite idea in this list. If it’s done wrong or it’s done half-heartedly, it can look even gaudier than a whole heaping pile of multicolor LEDs. For me personally, I don’t even like to put the manufacturer stickers that come with my components anywhere on my build. 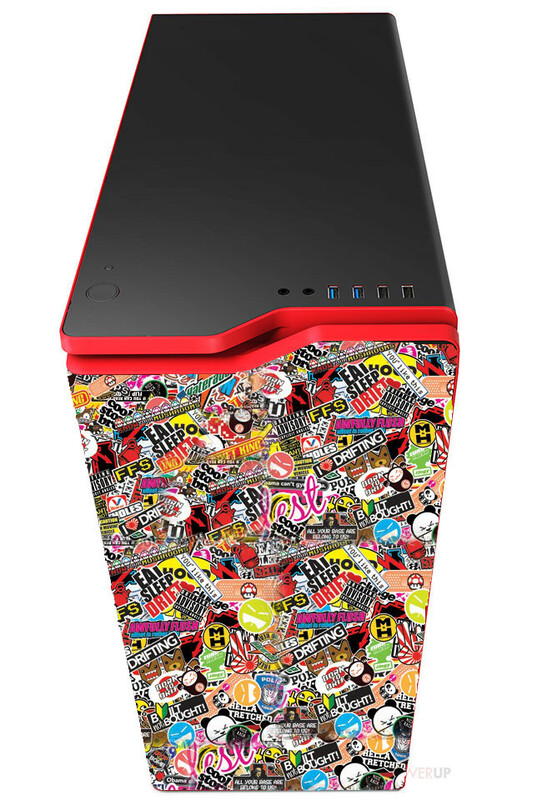 But it must be said: A case that is properly outfitted with custom decals or which is thoroughly sticker-bombed can actually turn out pretty great. Ultimately, this comes down to your tastes and preferences. The bold images of decals and the hectic colors of stickers are not for everyone; it’s kind of like how this whole ‘no LEDs’ thing isn’t for everyone. But if you’ve got the kind of attitude that matches that kind of statement-making, then by all means make it so. And that last one brings up the most important thing when you get to this stage in putting together your build: It’s all about you. The whole point of making aesthetic modifications to a PC is to make it look good. And that notion contains within it the implicit subjectivity of something looking good. The unstated end to the sentence is that you’re making it look good to you. You should do as much or as little as it takes to make your PC suit you. I like the clean lines and limited color palette of builds that look sleek, refined, and professional. That’s why my own build is in a boxy rectangular case, with a color scheme that is black-and-white with one dark accent color. But other builders like louder colors, or more colors, or fewer colors, or even themed colors designed to resemble comic book characters and soda products. So make it however you want! Just make it safe, and make it yours. And please share your modded builds, modded build ideas, and other ‘no LEDs’ aesthetic mod ideas in the comments below!